How to get around an Autodesk "Install Now" installation error. Written on September 18, 2017 . Posted in Knowledge Base, Products, Manufacturing, Architecture, BIM, Construction, Engineering, Plant, Tech Tips. Autodesk introduced the “install now” method to download and install Autodesk software from the Account Center a few years ago. The idea is that it offers an automated solution to allow users to simply start the process and let the installation take place without any further issues. The problem is that the download can be interrupted and even if the installation works the first time, all the files that have been downloaded cannot be reused. We get quite a few support cases every week about this issue. The Download Now method allows you to get around issues with internet interruptions. It also means that you have a full set of distillation files that can be reused on your PC or on other PC”s in your office. downloads and uncompresses full software install files using the Autodesk Download Manager. In the event of an interception. in most cases, the download can be resumed. You can also pause it and resume it if you need to. Download Now reduces the time it takes to get applications up and running by decompressing product files during the download. Files downloaded using Download now can be installed at a later time, on a different computer or as a deployment. Availability and Browser Compatibility: Download Now may not be available for all products and operating systems. If this download method is not offered when you sign in to your Autodesk Account, please use an alternate download method. If you encounter any errors with functionality or connectivity, please try using another Web browser or download method. Component Installation Failure: Make sure you completely uninstall all previous versions before attempting to install a new version. If you receive a message that some software components did not install, this is most likely due to software conflicts on your computer and not because the components did not download.See: Uninstall Using Microsoft Fix it. Locate the software you want to download in the list of Products & Services and click Downloads. Selecting Windows Platform: For Windows systems, 32-bit or 64-bit refers to the version of your operating system, which you can check by going to Control Panel > System. You must choose the correct version in order to use the software. Activating download options: Not all download options are available for each version and platform. You may have to select a different platform and/or click the More options link to see additional download options. Install the Autodesk Download Manager if prompted. 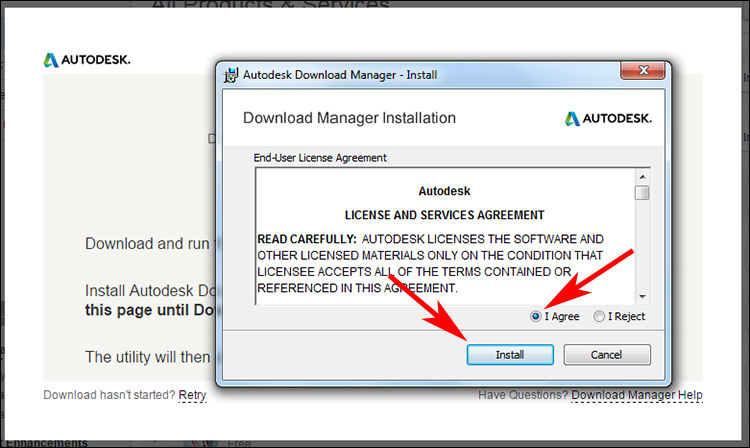 Accept the License Agreement, click Install and follow on-screen instructions. Note about “Communication Error” message: A “Communication Error” could indicate a problem with your browser’s security settings.See: Communication Failure message during download and installation. Click OK when prompted for a save location by the Download Manager. This saves the install file in the default location (recommended). The Download Manager will display download progress. When the download is complete, you will see options to Install or view the downloaded files in your file browser. I would recommend that you use the browser download over the other ones as a matter of habit and I would encourage you to let others know about it too.